This week my students have been working on writing a passage-based essay. They are using two different texts from the Wonders series, and are synthesizing information from the two texts for the essay. As I talked with students about their essays, I found that many were struggling with adding text quotations. One student tried to start the essay with two quotations from different texts, without any introductory phrases. Another added text quotations in the middle of paragraphs with no context. Another said, "I'm tired of using 'according to the text'. What else can I say?" I realized that this was probably a skill that the whole class felt shaky with. Even though they've been writing passage-based essays for two years now, they are still not sure of how to integrate the text quotes into their own writing. I started to remedy this with some read aloud. 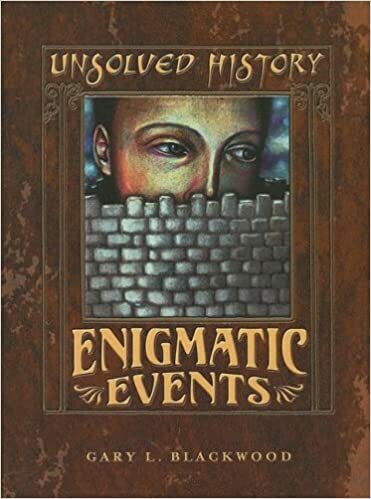 First, I chose Gary Blackwood's Enigmatic Events for its engaging content and great use of quotations from primary sources. Students need to hear much much more of the kind of academic writing that they are expected to do read aloud for them. The handout shows different ways to introduce text quotes. In the first part, students underline the introductory words and phrases. In the second part, they figure out how to use the punctuation correctly by looking at examples. We're still working on the best ways to add text quotations, but I feel that we're making progress! Next time--writing introductions. 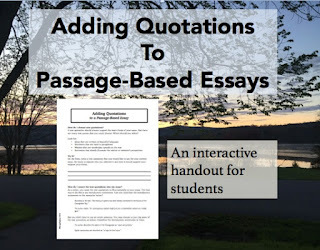 You can find the handout for free at this link: Adding Text Quotations to Passage-Based Essays. I really admire tessellations. When we set up our game of Catan, I always marvel at how the hexagons fit so beautifully together. The same goes for Takenoko, a new game that my son got for Christmas that I just love. 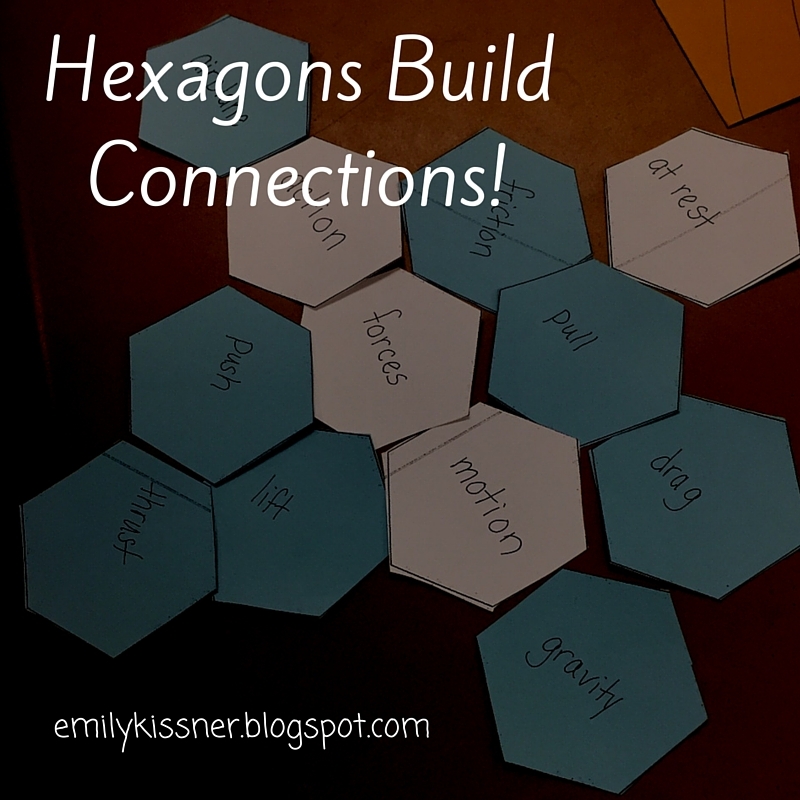 So when I saw some blog posts about using hexagons to review key ideas, I was intrigued. It seemed like a great combination--using tessellations to make content review more meaningful and engaging. The idea is simple. 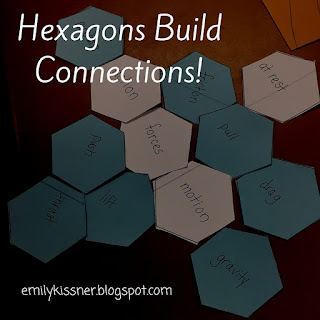 Take some hexagons, write concepts or words on them, and have students connect the tiles. The key is that students should be able to explain their tessellations, describing how the different ideas are connected. I made mine in Google Drawings. Apparently everyone else in my house knows that holding "shift" while creating the shape makes a regular shape--it was a new trick to me! I left some spaces between them to allow for easier cutting. Because this was the first time for me to use this activity, I decided to add the content words. I chose words that go along with my current forces and motion unit. I told my students: "Our goal here is to see and explain how these ideas from our unit are related. The more connections we can make, the more easily we will be able to work with these ideas and use the vocabulary." I circulated to watch carefully what was happening. Some students set up interesting shapes right away, while others struggled a bit. I encouraged them to go back to their resources to check for ideas and information! For the first set of gallery walks, students got up and walked around the room to hear from their peers. In some cases, the seated students challenged their friends to guess, while in other cases they pointed to the hexagons and shared their sentences. Having the four different colors made grouping for this really easy! had differently colored hexagons to try to make new connections. Some groups challenged themselves to make one giant tessellation, while others made sets of small ones. As a review activity, this worked very well to get kids using challenging vocabulary. I heard great dialogue between students as I walked around the room: "I'm not sure how I could add acceleration here" or "What is lift again?" I hate review games in which only one or two kids practice answering questions, and this worked well to get everyone involved. Some kids even asked to take the hexagons home for more practice! 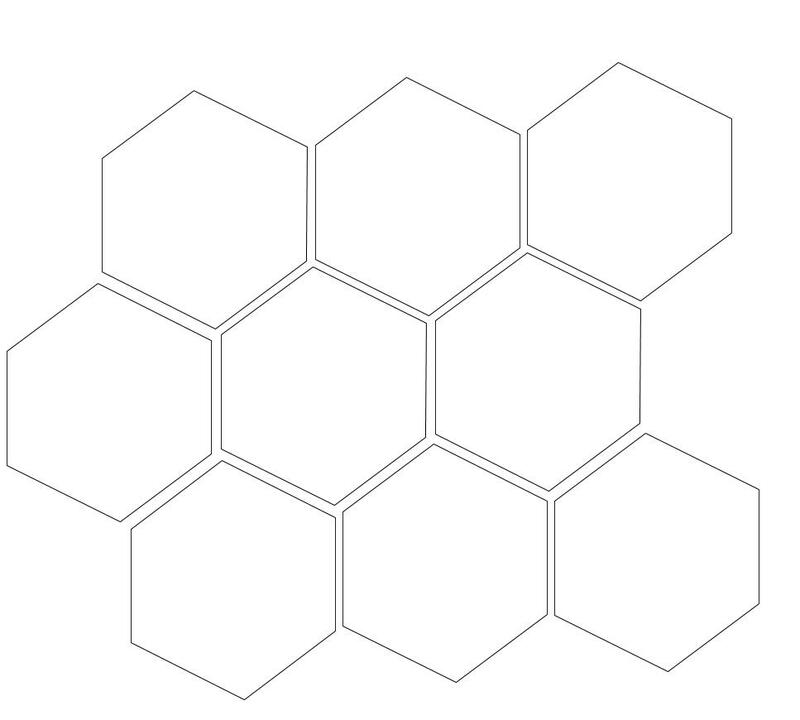 Next time, though, the hexagons will be much, much more artistic. 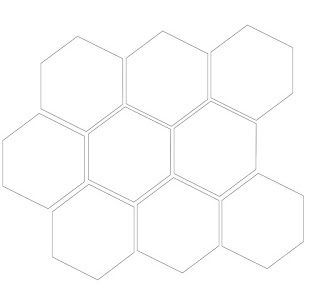 I can't wait to see what students do when I hand over the blank hexagons to them at the end of the next unit. I've always been sort of ambivalent about task cards. 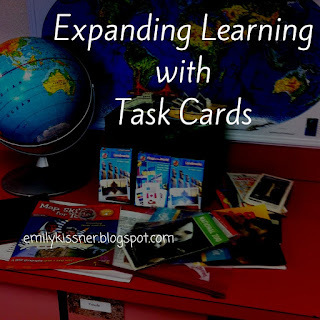 While I like the idea of students getting up and walking around the room as they practice key concepts, I don't like the fact that task card tasks tend to nurture...a focus on "tasks". One of my key goals is to get readers and writers to think more deeply and linger over text. When students see a long list of blanks to fill in, their brains tend to switch to "get it done and over with" mode. This week, I tried a set of science task cards to help students review forces and motion. But how could I get kids to think more deeply? Have kids complete task cards as usual, emphasizing quality of collaboration over quantity of answers completed. We even modeled and practiced collaborative conversations and how to check back through our resources. This is when the hard thinking begins! First, I sorted the task cards into sets of odds and evens. 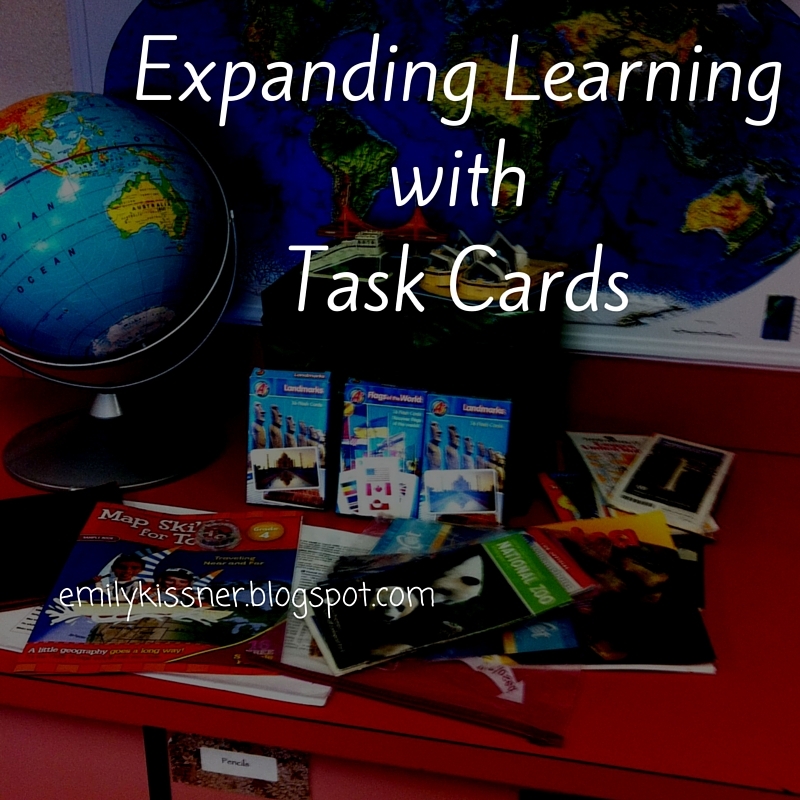 Then, I gave each pair of students a set of task cards. No need to put them in any sort of order--just make sure that one pair gets two even cards, the next pair gets two odds, and so forth. Each pair of students then became an expert on their task cards. I projected the answer key to the whole set of task cards with these directions: "You and your partner are about to be the experts for your two cards! Check your answers with the answer key to make sure that you have the correct answer. Then, find evidence in your science folder that supports the answer. Be ready to explain the steps in getting the answer or to give other examples." Then, the students with even task cards stayed at their seats to be the experts, while students with odd numbered task cards moved in pairs to check their answers with the experts. It was great to see how explanations developed--from across the room I could see students displaying pages of their notes, gesturing with their hands, and explaining calculations. After the first session, students nominated expert explainers and we talked about what had led to their high-quality explanations. Then, students reversed roles and repeated the process. Not every task card got checked or completed--but that's okay! Remember, quality trumps quantity each and every day. Our work as teachers is not to make sure that every line gets filled in. While it added time to the whole process, the quality of discussion and engagement really showed the value of the expert time. Instead of the teacher grading seventy task card answer sheets, students got to be the experts and explain answers in real time. What other tricks have you used to expand the thinking with task cards?